Since I haven’t watched the movie in years, I had forgotten this little story. It caused me to ask myself some questions. Do I pray with faith? Do I take action, knowing that God will supply all my needs? But it’s also the works that are done because of that trust. It’s stepping out on those waves because we see Him walking towards us with His hands outstretched, and that is enough to make us risk the impossible. May His Words sink deep. ask whatever you wish, and it will be done for you. and so prove to be My disciples. and that your joy may be made full. that you love one another, just as I have loved you. Greater love has no one than this, that one lay down his life for his friends. You are My friends if you do what I command you. for all things that I have heard from My Father I have made known to you. He may give to you. This I command you, that you love one another. Let’s prepare for the rain. WOW!! 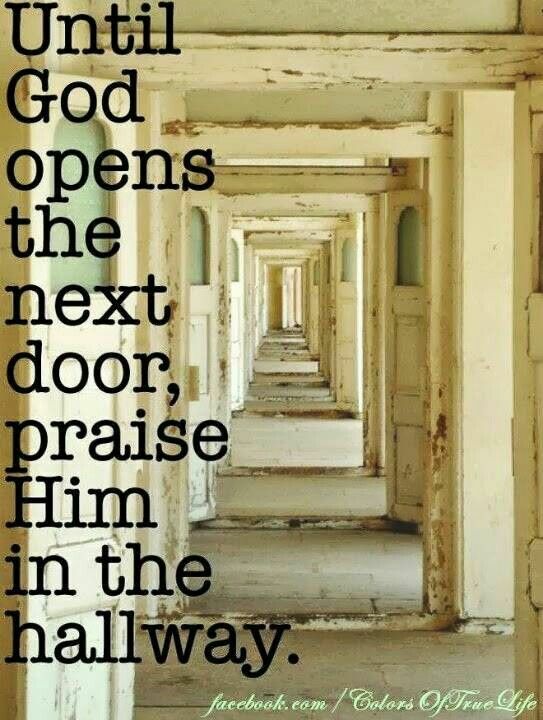 I love that picture and quote about praising God in the hallway! What fun! I have never heard that before! That made my day! Thank you for sharing you heart, Joy, as always it is a pleasure! Thank you, Miss Holliday! ;) I love that quote/picture too. :) God is so good! And you’re such a blessing from Him! Joy, I REALLY enjoyed your blog post. The quote from the movie really touched my heart. Letting God lead us is sometimes hard but your post really comforted my heart… Thank you. You are truly so wise and and God has blessed you in many ways, especially in blogging. Thank you for sharing your thoughts and your heart.